Bray Carnelian Bay Rental is situated in Carnelian Bay and offers barbecue facilities. The accommodation has free WiFi. This holiday home features 3 bedrooms a fully equipped kitchen a dining area and a flat-screen TV. 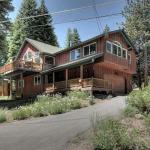 Reno is 43 km from the holiday home while South Lake Tahoe is 32 km from the property. Reno-Tahoe International Airport is 43 km away.